It is a billiard simulation game you can use to learn how to play billiard games and enjoy playing the game with your friends. 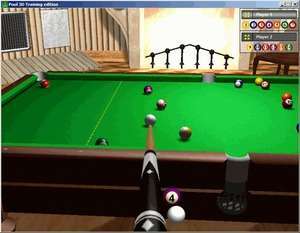 It truly simulates billiard physics including side ball spin, back spin, forward spin, curve ball trajectories. The 3D engine lets you move viewpoint in all directions and make it closer to table or farther from it. You can move it while ball movement to see trajectories in the most convenient way. Pool 3D Training Edition 1.519 is a shareware program and can be used as a demo to try the software until the free trial period has ended. A full version of the program is available after the trial period ends. For security reasons, you should also check out the Pool 3D Training Edition download at LO4D.com which includes virus and malware tests. Additional screenshots of this application download may be available, too. Pool 3D Training Edition has a presence on social networks.